Irwin Boats for Sale There is 1 yacht. Ted Irwin was seven years old when his family moved to the Tampa Bay area of Florida. That move began a lifetime of commitment to the sailing designing and building of sailing yachts. At fifteen, Ted started building boats of his own design in his backyard. From this self-taught experience came the knowledge that was to later enable him to design a “moth”. In that boat he won the North American and the world championships in its class. After several years of formal education, painting, and backyard boat building, Ted landed a job as a draftsman, illustrator and part-time builder with Charlie Morgan. Ted was twenty-one. By 1963, Ted had served a stint in the Coast Guard, done some more studying and decided that it was time to go out on his own. Ted rented a small Quonset hut on St. Petersburg Beach for $75 a month. There he built his first commercial sailboat. It took an arduous six months to build his first 31 footer, but it was an effort well spent. That boat, named Voodoo, was to launch Ted’s career by logging an astounding racing record. Voodoo raced for two years in the Florida Ocean Racing Association, 1964 to 1966, and swept all honors. Ted, sailing Voodoo, won twenty-four out of twenty-eight races during that period. Voodoo and her crew did so well that a sailing editor said, “All the other boats were racing only for second place”. Other successes followed. Some of his famous racing yachts with names known the world over include: Voodoo, Black Magic, La Pantera, Razzle Dazzle and R2D2. Ted successfully used the knowledge he gained in building high tech racing boat to build high performance cruising yachts. At any time, Ted, a prolific designer, has had as many as 15 models in production. Ted incorporated as Irwin Yacht & Marine Corporation and in 1966 moved to the new site of the Irwin factory. The original factory had only 12,500 square feet. It grew to over 75,000 square feet and over two hundred employees. Ted’s innovative designs blend luxurious accommodations and easy sail handling in a fast hull. The Irwin philosophy was simply to build a good boat for the money - make her stylish and fast - stable and comfortable. Irwin Yacht was the only major yacht manufacturer whose Research and Development Program used international yacht racing to test new designs and construction techniques. Ted was still fiercely competitive on the racecourse, however pipe berths gave way to air-conditioning and generators. 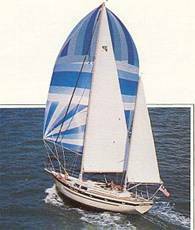 His Irwin 68, Distant Drummer, boasts a full set of racing sails, a 3-speed coffee grinder and an on-deck Jacuzzi!!! Below decks is the epitome of elegance and convenience with accommodations for 10, yet the yacht can be sailed by 2. Irwin was proud to have built more cruising sailboats over 50’ than any other boat builder in the world!!! Over 6,000 yachts have been built. Over 300 Irwin 52, 54, 65, and 68s are sailing around the globe. Ted Irwin was the chief designer, company owner, and did the bulk of the research and development. He bought everything by the boxcar - From fiberglass to winches and sails. Debt Service - Compared to others in the industry, Irwin Yacht owned outright all its land, factory and tools. Most other builders had to deal with hefty amounts of debt service and that lead to higher costs. Irwin Yacht and Marine Corp. was vertically integrated company. Irwin built everything they could in house. From brochures to pedestals to masts.